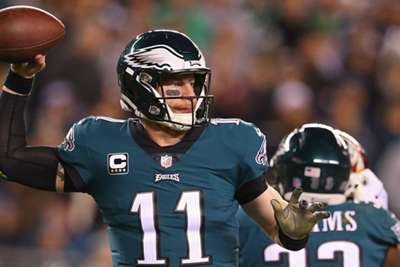 Philadelphia Eagles quarterback Carson Wentz will miss Sunday's clash with the Los Angeles Rams due to a back injury. The Eagles downgraded the quarterback from doubtful to out on its injury report on Saturday. Eagles coach Doug Pederson told reporters on Friday that Wentz was dealing with a stress injury and the expected recovery time is three months. "This thing has evolved over time, and it requires zero surgery to heal," Pederson said. Philadelphia had no further comment to make on Saturday and it is not known if Wentz could return this season, although that prospect appears doubtful. ESPN reported on Thursday that Wentz has a fractured vertebra. The injury first came to light on Wednesday when Pederson revealed Wentz would miss practice because of back spasms. The Eagles will now turn to backup quarterback Nick Foles, who led them to a Super Bowl victory last season after Wentz went down with a torn ACL in Week 14 against the Rams.